When you’re on the go with your gadgets there is nothing worse than hearing a low battery alert. Panasonic is looking to keep you charged when you’re away from power with its new line of high-capacity USB Mobile Power Supplies. Panasonic's new line will feature 8 different models ranging from lightweight and portable to high capacity, energy center. The model in the series with the highest capacity, the QE-QL301, contains 2 USB ports and enough juice to fully charge a smartphone four times on a single charge. 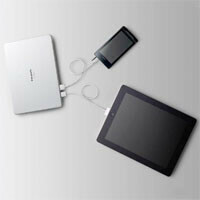 Panasonic’s portable USB Mobile Power Supplies are slated to be released in Japan on May 28, 2012. Unfortunately, other market release dates have not been published yet. If they perform as well as they claim, these mobile power supplies will be great for a variety of applications from spoiled camping trips to actual emergencies involving power outages. I got my dad a really nice one made by a company named New trent and it can charge his iphone 11 times and his ipad like 5.